Trusts are back in the headlines. This time courtesy of David Cunliffe, Leader of the Labour Party. But what really is a trust? A trust is a legally binding arrangement when a person (settlor) transfers legal ownership of assets to certain chosen people (trustees) to be held on trust for the benefit of persons (beneficiaries) named by the settlor. 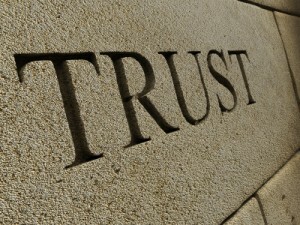 Once a trust is created the settlor loses legal ownership of the asset(s) in question. The settlor may however be a trustee and/or a beneficiary. The beneficiaries are the only persons entitled to benefit from the assets of the trust. A trust will be established by way of deed. This document is both the rules and operators’ manual of the trust. Included in the deed will be who can appoint trustees, what the trustees powers are, who the beneficiaries are, the rules for administration and management of the trust. Why establish (settle) a trust? Implementation of forced savings (to protect and maintain a special purpose (education, retirement) fund. Asset Protection (affords protection from liability that attaches to trustee/settlor/beneficiary in their personal capacity. Succession Planning (for family owned businesses in particular enables the continuation of asset ownership without changing entities when mantle is passed down. The cardinal rule with trusts. Always obtain professional (legal and/or accounting) advice.